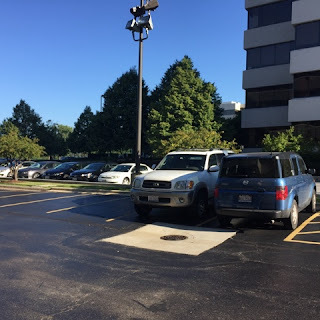 For some reason, the person who owns the white SUV, really likes this parking spot. She purposely parks in that one, taking the extra effort to back into it. Whereas I like the one I'm in because at least to one side, no one can park next to you. I've seen the lady park in her spot even when the one I like is available. Isn't it funny the way some people get really into their parking spots? On the opposite side of the spectrum, 2 jobs ago, there was a girl who drove a bright red car and *always* parked it horribly. 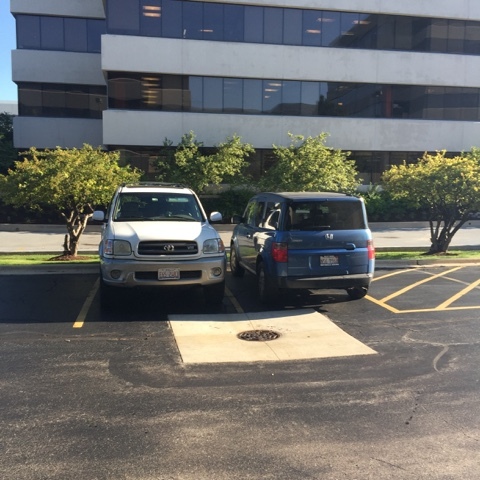 No matter where she parked, it would be crooked and often people couldn't park next to her because she took up a little of the parking space next to her. Obviously trying to prevent anyone from parking next to her and dinging her car with their door. I've seen people struggle to parallel park when if they had just gone one, maybe two cars further up ,there is a football field of space to park in...but no we Americans have to park as close as possible to our destination because lazy beats fat.